Burnley boss Sean Dyche feels that record signing Andre Gray is in the perfect environment to continue his progression as a player. The 24-year-old, signed from Brentford for £6m in August, has made an incredible rise from the lower tiers of the football pyramid where he represented the likes of AFC Telford United, Hinckley United and Luton Town. He’s in an environment that is about improvement, development, learning, demand and winning. That is something for him to thrive on. There are few fairytale stories of non-league footballers reaching the top at present, but those rare examples are particularly impressive. Leicester City striker Jamie Vardy played for Stocksbridge Park Steels, FC Halifax Town and Fleetwood Town before getting his break and has gone on to eclipse Ruud Van Nistelrooy’s Premier League goalscoring record on top of earning a cap for his country. Former Claret Danny Ings has also marked his ascendency from Dorchester Town with appearances in the top flight and a call up to Roy Hodgson’s England set-up. But while Dyche insists that there are no guarantees in the sport, he acknowledges that the club’s leading scorer is going the right way about emulating the achievements of the aforementioned duo. “There are no guarantees,” he said. “For the five or so players that you mention there’ll be another 15 million who haven’t done anything. “There’s no guarantees to it. It’s constant hard work, constant belief in your ability and constant drive. They are the qualities that we do believe that Andre has got and he’s been displaying them this season. 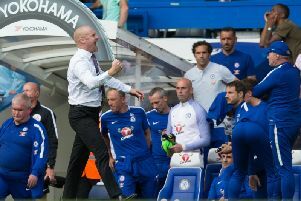 Dyche added: “He’s enjoying his football. He’s in an environment that is about improvement, development, learning, demand and winning. That is something for him to thrive on. “We’ve had good signs, not just from Andre, from so many players who have joined the club and become a big part of what the club is and what it stands for. “He’s been a good advert for that so far alongside the other players that we’ve brought in with Joey, Tendayi, Lowts. Another striker to break the mould is QPR’s Charlie Austin, who could start at Loftus Road in tomorrow’s Championship clash having made a comeback from a groin strain. The one-time bricklayer was also called up to the Three Lions squad after netting 18 goals in the top flight last term. The 26-year-old, who left Turf Moor just over two years ago, played for Kintbury Rangers, Hungerford Town and Poole Town before getting a step up the ladder. “I think he’s back, from the general knowledge that’s out there on him,” said Dyche. “He’s a good lad and a good player. He managed to get himself in touch with England in the summer as well. There’s lots of good players in this division so we don’t over-think one over the other. “You’ve got to deal with all the different challenges that come your way. “They’re a very experienced group with some very good players but you could say that about so many teams in the Championship.